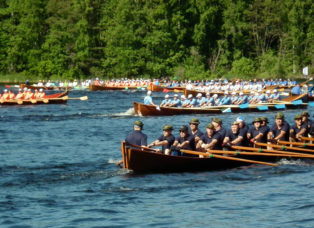 Sulkava Rowing Race is Finland’s biggest rowing event that has gathered in its best years over 10 000 rowers and over 20 000 visitors. In the most categories the route is approximately 60 km, expect in two days tour rowing race 70 km. These two routes take the rowers around the isle of Partalansaari where the rowers can enjoy the beautiful Finnish nature while competing. 30 km Stadium-Linnavuori-Stadium offers good alternative for 60km route for those who prefer shorter distance. During the weekend there are starts where rowers can participate in small boats, special boats and Sulkava long boats, in addition the Finnish Championship -starts will be rowed. There are four different categories which are: single rowers, bi-stroke rowers (one pair of oars and a paddle), couple rowers (two pairs of oars) and group rowers (special boats and Sulkava long boats). Canoes and kayaks are welcome too! Sulkava long boat crew consists of 14 rowers and a cox who paces them. Each rower has one oar and rows on a sliding bench. The cox also steers the boat and urges the rowers to their task. The event always ends on the second Sunday of July. In the tour rowing will be rowed approximately 70 km during two days. 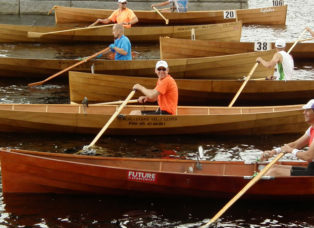 The tour goes around the isle of Partalansaari and starts from the municipality of Sulkava (the Rowing stadium) and continues to Hakovirta – Kietävälä Varviranta and back to Sulkava (Rowing stadium). Participation fees are cheaper when you pay earlier. All accommodation related things Sulkavan Matkailu ry and Sulkavan Lumo Oy . Here you can see the route map for Sulkava Rowing Race. Sulkava Rowing Race is in the middle of Sulkava. In Rowing weekend we have some special arrangements. In the map you can see the Race Center, places for parking and other important places. Here you can see also earlier summers’ results.